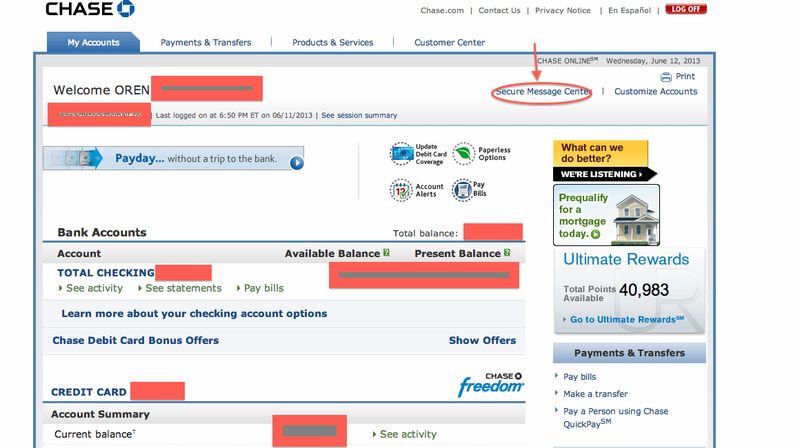 I signed up for the Chase United MileagePlus Explorer credit card for my wife a couple months ago. The current sign up bonus, which is the one I signed up for was 30,000 United Miles if you spend $1,000 in the first 3 months. I had read online that there was an offer for the same card with a 50,000 mile bonus (55,000 when you add an authorized user), but I hadn't signed up for it. I also read about possibly getting a $50 credit as well. Not surprisingly, when I spent $1,000, 30,000 miles were credited to my wife's United account. I wanted the extra miles so this is what I did and you can do it too whenever there has recently been an available offer that's higher than your bonus. I have done it with Chase and Citibank. I don't know if it works with American Express. Click on "Secure Message Center"
Then Click on "send a secure message"
Choose the credit card and the category of message you want to send and send you message. After I signed up for a 30,000 mile sign up bonus I noticed that there was a 50,000 mile sign up bonus with a $50 statement credit. Can I please be matched to that offer? Thank you very much. It only takes a minute and your results can be great. As you see, I didn't even send a link or a screen shot of the available offer.